This is an interesting project under development – a Linux-based operating system intended for miners of Ethereum or Ethereum (ETC) plus SiaCoin (SC) dual mining that comes with a centralized web-based monitoring and control dashboard. The SimpleMining Easy OS uses the Claymore Dual Miner, though it does not yet support all of the video cards that are supported by the miner. You can use it only on AMD Radeon R300/R200/HD7xxx series of GPUs with support for Radeon RX400 expected to be available soon and maybe even Nvidia support to be added at a later time. What is interesting is that you don’t need to use remote control software to monitor and change the operating parameters of your Mining Rigs, you can do it through a dashboard on the official website of the project directly. 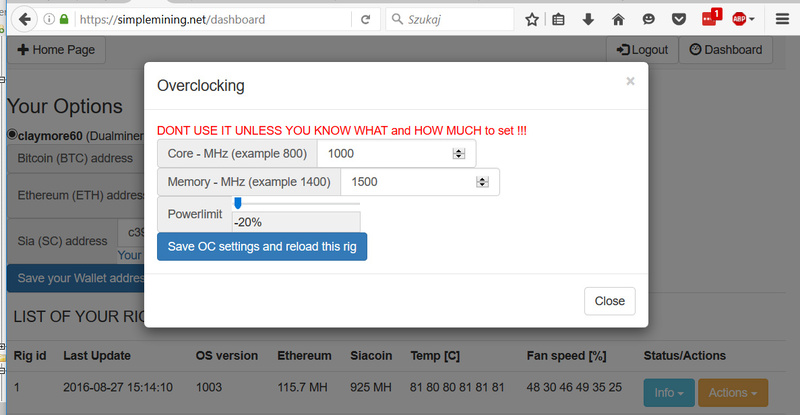 The latest update of the SimpleMining Easy OS did bring even overclocking support through the dashboard, though that may not be wise if you don’t know what your GPUs can handle… it is best to find the optimal settings with direct access to the mining rig as it may hang with the wrong frequencies. For the moment SimpleMining Easy OS does need at least an 8GB drive (could be used from a USB stick) and you only need to set your email in the configuration that you are going to be using to login on the website for monitoring and control of the mining rig. There are some security concerns regarding the access from web and the login with only email address though, so you might want to be careful what email address you use.